Florida tomato growers are arming themselves with a wider arsenal of tools for the annual fight against whiteflies and the virus they carry. Genetic traits, new chemical sprays and integrated pest management (IPM) techniques all help to manage the pale tiny insects, which are each only one-sixteenth of an inch long. Florida growers’ piece of the tomato market are high-dollar fresh steak tomatoes, transplanted into plastic mulch, staked and tied, with 3-4 pickings per season, Mitchell said. There are two seasons. During the fall season, plastic starts being laid late summer and transplanting starts in September, with the tomatoes being harvested in November and December. During the spring season, plastic is laid in January, he plants go in the ground in February, with fruit being taken off in April or May, depending on the region of the state. The fields typically go idle during the summer. Whiteflies feed on the plants with a piercing-sucking feeding action, which makes them a vector or carrier for the spread of tomato yellow leaf curl virus (TYLCV). New commercial varieties of tomato have been bred for tolerance of TYLCV, said Hugh Smith, a University of Florida associate professor of entomology and nematology. “There are a few, and they kind of vary from region to region,” he said. Not all of the TYLCV-tolerant varieties produce yields competitive to that of other commercial tomato varieties, Smith said, so in many cases when choosing their tomato, growers face a “trade-off” for yield versus disease resistance. A few varieties, such as Harris Moran’s 1823, a medium-size tomato, show good yields and fruit quality in addition to the virus tolerance. Harris Moran 1823 was selected as the 2017 “rodeo tomato” of the San Antonio Livestock Show and Rodeo, based on 2-3 years of trials by Texas A&M AgriLife Extension Service. Smith said a wide variety of chemical product is available for controlling whiteflies. Group 4a neonicotinoids such as Sivanto can be used in a rotation with group 28 diamides such as Verimark and Exirel. Another option is Sefina, a group 9b insecticide that was released by BASF in 2018. 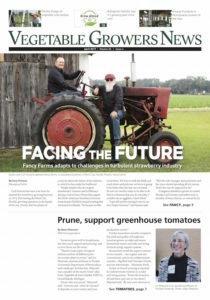 “Typically growers will use a soil application first, and that’s right at planting, when they put the plants in the ground, they inject a soil insecticide and that literally holds the plants for 4-5 weeks, depending on how the weather goes, and at that point growers come back with a foliar application, material like Sefina,” Mitchell said. The benefit to using Sefina is it has a unique mode of resistance and is the only 9D-group insecticide on the market. “It works very quickly and disorients the whitefly, so they don’t know how to feed, and a lot of times they’ll fall off the plant,” he said. “It makes it difficult for them to get to other plants, and that’s why we’ve seen the use of Sefina really reduce the movement of (TYLCV).” Sefina is supposed to be safe for bees, Mitchell said. Using a variety of chemical compounds on the insects makes it less like they’ll develop a tolerance for the insecticides, Smith said. “It’s important to take advantage of all the ones we have out there,” he said. Growers can also minimize insect movement and virus movement by practicing IPM. Plastic and silver mulches can help control whiteflies, Smith said. He added that it’s important to destroy the tomato field after the last harvest, which will take the virus and insects away from the field. Mitchell said whiteflies can overwinter on other plants during the winter, so keeping the hedgerows clean from TYLCV or host plants is important. “You just want to make sure your stuff is as clean as possible,” he said.